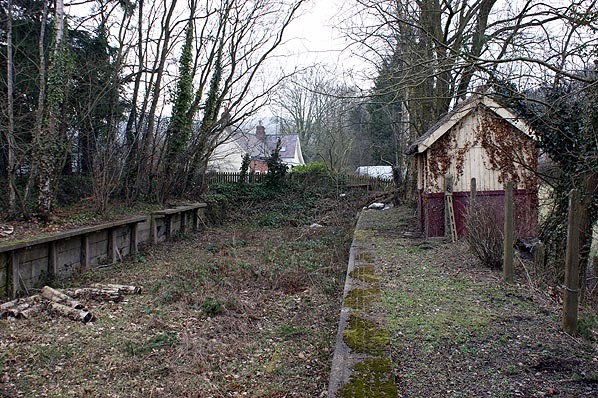 Present state: Stationmasters house in use as private residence, platforms and waiting shelter are still extant. 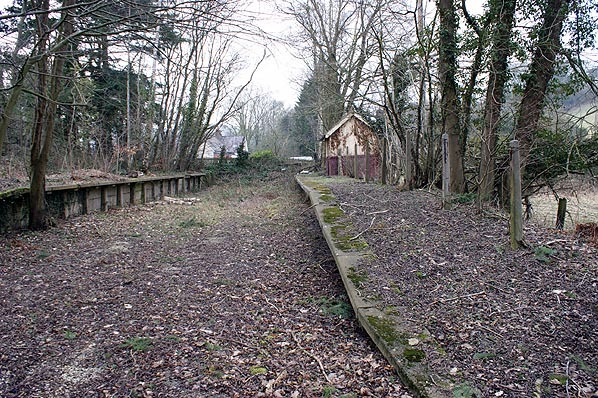 Notes: Star Crossing Halt was situated on the Mold & Denbigh Junction Railway’s (M&DJR) line that linked the two North Wales towns of Mold and Denbigh. The line had opened on the 12th of September 1869. Train services on the line were operated by the London & North Western Railway (LNWR) which by 1869 owned the Chester and Mold line which had an end on connection with the M&DJR route. Star Crossing Halt opened on the 2nd of November 1914. 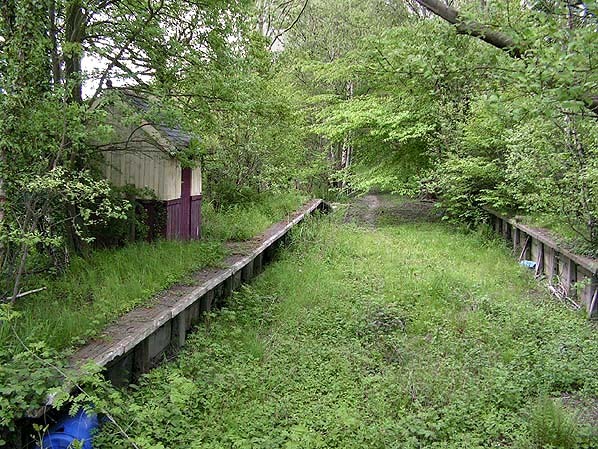 It was located on the east side of a level crossing in a remote location. The nearest village was Cilcain some two miles away. The line was double track and the station was provided with two platforms which at the time of opening were constructed from timber. It also had simple wooden waiting shelters on each platform. 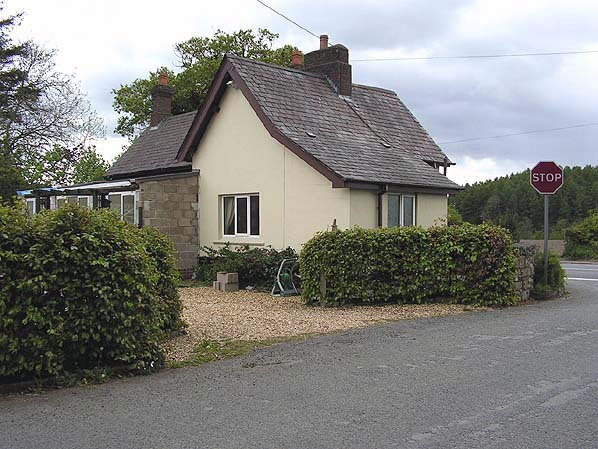 At the western end of the station on the southern side of the line there was a single storey stone crossing keepers cottage. Pre printed tickets for Denbigh, Mold and Chester were kept at the crossing keepers cottage as was an excess fares book. The tickets were sold to passengers by the keeper. Star Crossing was superintended by the Station Master at Rhydymwyn, to whom any cash was sent on a daily basis for banking and accounting. The station was served in the main by trains that ran between Chester and Denbigh but also had services that continued on from Denbigh to Ruthin. There were also shorter workings between Mold and Denbigh. On the 1st of January 1917 Star Crossing Halt was closed to passengers as a war time economy measure but it re-opened on the 1st of July 1919. On the 1st of January 1923 Star Crossing Halt became part of the London Midland & Scottish Railway (LMS). The M&DJR had kept its independence right up to that time. By the summer of 1932 the LMS provided only three services in each direction on weekdays. The westbound services went to Denbigh and the eastbound to Mold. On the 1st of January 1948 Star Crossing Halt became part of the nationalised British Railways (London Midland Region). British Railways provided Star Crossing with more trains than the LMS had. In the mid 1950s there were six in each direction and they included through trains to both Chester and to Ruthin. 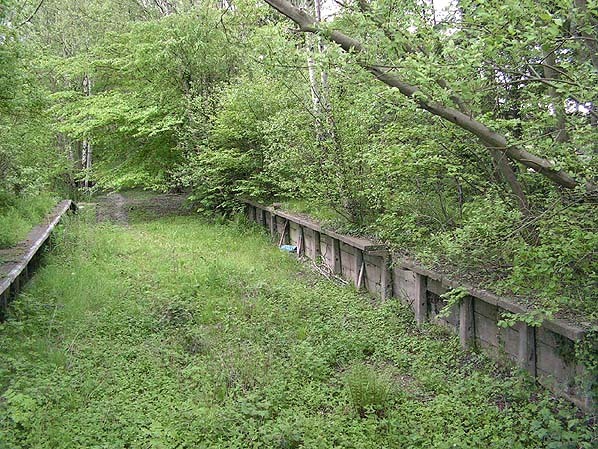 At some point prior to 1960 the stations wooden platforms were replaced with concrete faces backfilled with cinders. Also in the 1950s pre printed tickets were held at the cottage for Liverpool and Manchester excursions. Despite being in a remote location Star Crossing Halt survived until the 28th of April 1962 when all passenger services were withdrawn from the line. Remarkably for such a small halt much still survives including the crossing keepers cottage, which is in use as a private residence. The east end of both platforms and the Chester platform waiting shelter also survive although only the cottage can be seen from the public highway. 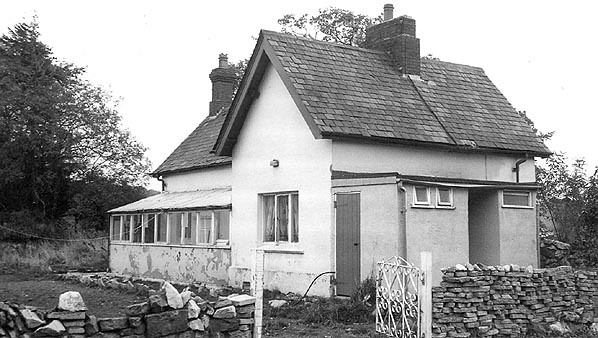 The crossing keepers cottage at Star Crossing Halt seen on 25 October 1979. Looking west at Star Crossing Halt on 4 March 2011. Looking west along the Chester direction platform at Star Crossing Halt on 4 March 2011.